Brazil’s northeastern state of Ceará offers some of the country’s most stunning beaches. While visiting Fortaleza, I took a day trip to explore some of the coastline to the east of the city. A local friend of mine helped me find a tour company, Enseada, that would take me to the beaches east of Fortaleza on a day trip. I also booked a trip to Jericoacoara through the same company. It was pretty inexpensive overall and I thought the tour company did a fairly decent job. After picking me up from my pousada and several other passengers, the bus took us out to the eastern outskirts of Fortaleza. The city gave way to a countryside of palm trees, red rocks and open space. Small stucco buildings with red tile roofs lined the sides of the road. Our first stop was the picturesque town of Beberibe, perched on a rocky cliff overlooking the ocean. The town has a Mediterranean charm to it. We got out of the bus and walked through the town and then down through a series of red, pink and white rocks by the ocean. This beach is known as the Praia de Morro Branco, one of the most popular day trip destinations from Fortaleza. Surfers were out in the water, taking advantage of the powerful waves. A sandy trail leading down to the beach through a small canyon. Cactus plants also appear here and there along the trail. The red rocks provide a sharp contrast against the blues of the ocean and sky. At the end of the trail, we reached the beach where dune buggies were waiting to take us on the next leg of the journey. 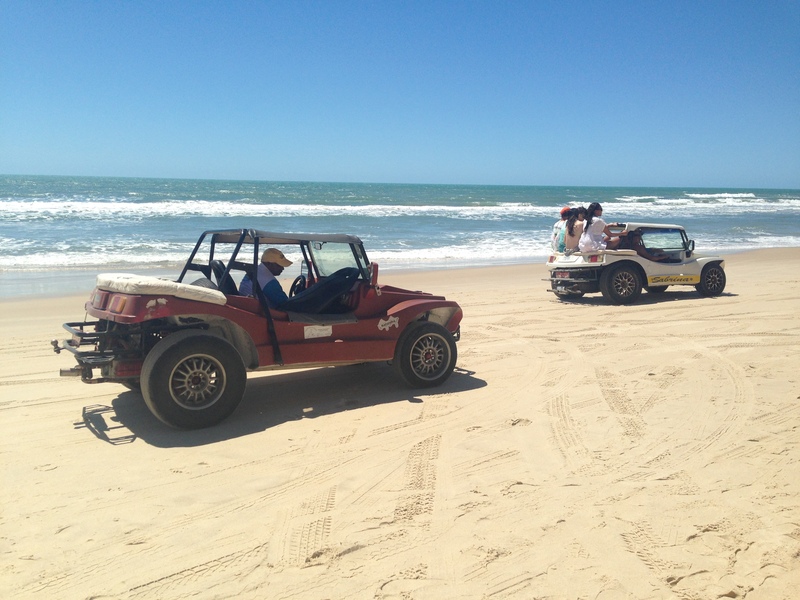 The buggy ride on the beach was an optional part of the tour, but well worth doing. Whizzing along the edge of the ocean while sitting on the back of the buggy is a remarkable way to experience the beauty of the beach. We passed cliffs, waterfalls and caverns. We stopped inside one of the caverns on the Praia das Fontes to take pictures. 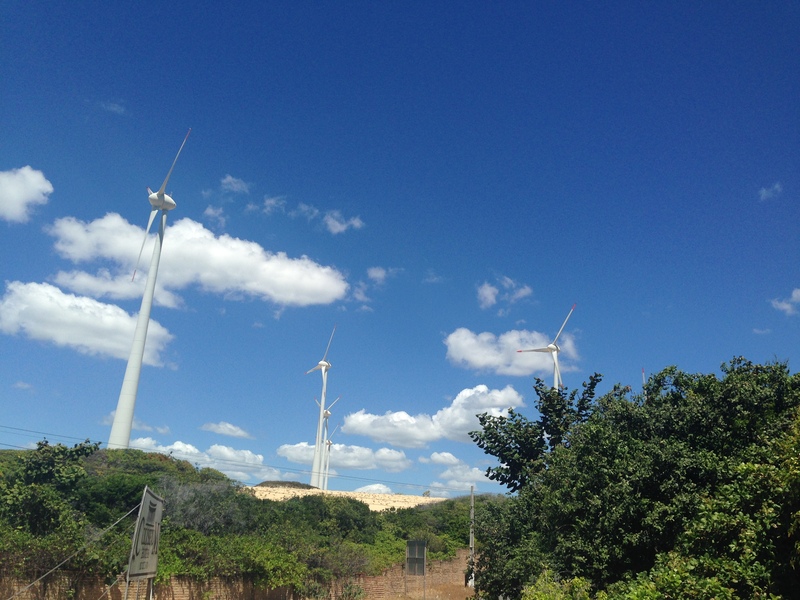 Leaving the beach, we rode up into the hills and past giant white wind turbines, a common feature along the breezy Ceará coastline. Our buggy stopped at a lake where we could relax and have a swim. 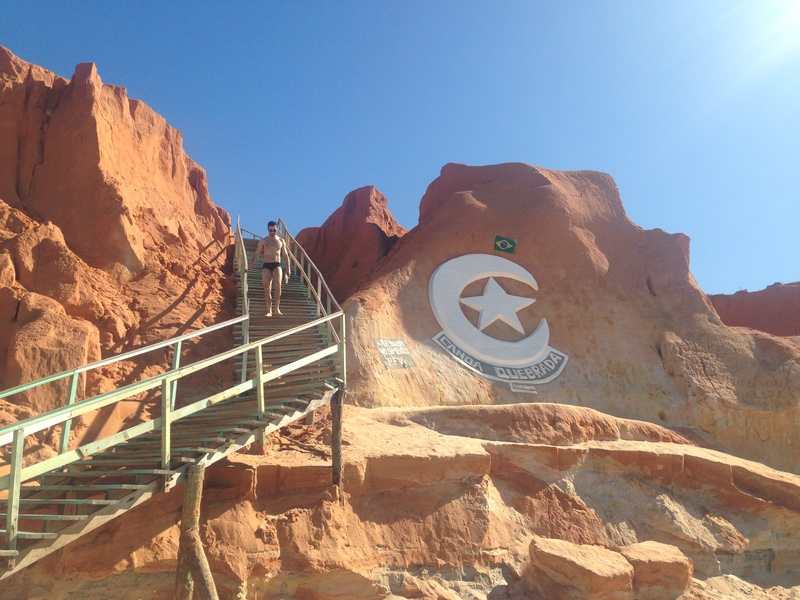 After spending some time at the lake, we rejoined the bus and moved on to the final stop — Canoa Quebrada. 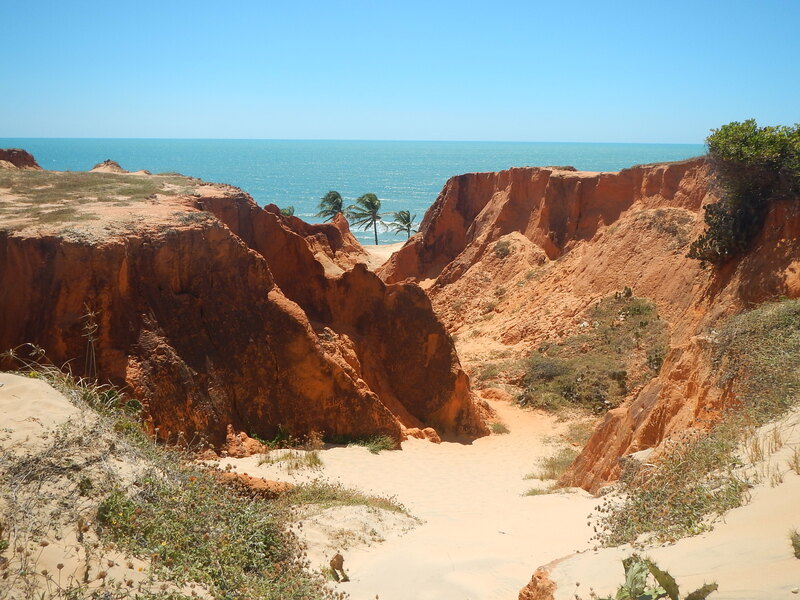 Canoa Quebrada is situated on a rocky red cliff overlooking the beach. The town has a main drag of shops and restaurants that they refer to as Broadway. Canoa has a history of being a hippie community, a place where people active in Brazil’s counterculture sought refuge in the years of the military dictatorship. 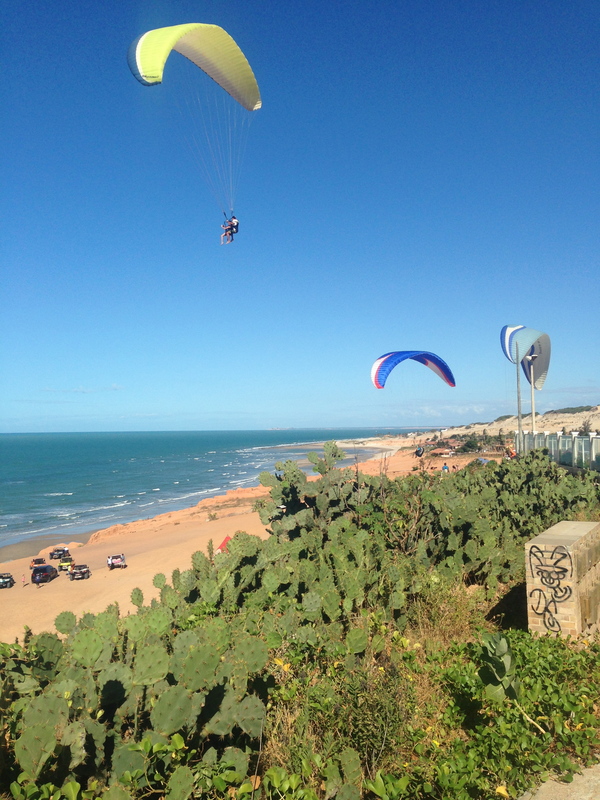 Along the cliffs, people were practicing paragliding, floating over the edge of the cliff overlooking the beach. In the water, kitesurfers glide around on the wind and waves. I walked the length of the beach, climbed up the stairs along the walkway and explored some of Broadway as well. 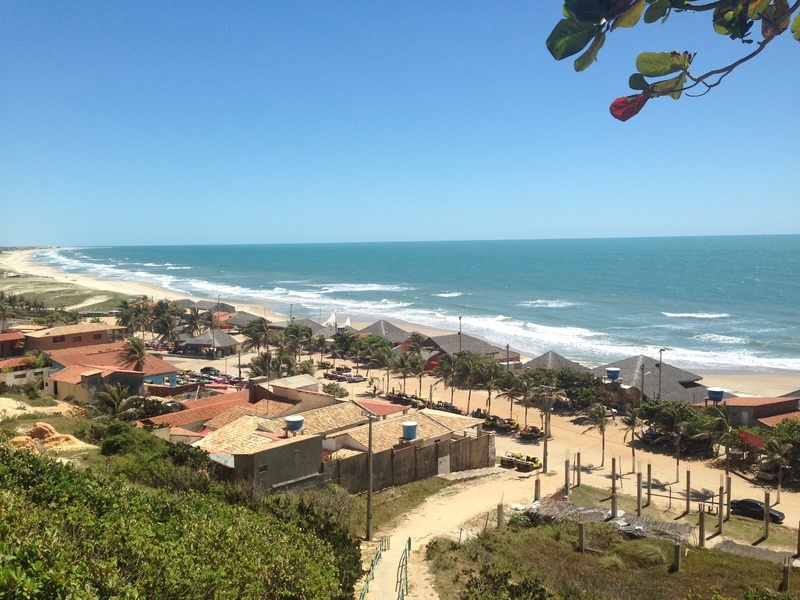 I thought Canoa Quebrada to be a charming and fascinating place. The tour only provided a three hour taste of Canoa, leaving me wishing for more time to spend there, especially on a weekend when I hear the town is quite lively with visitors!